Saturday Spotlight SSHP13-Love without the hearts! Supplies: Card Blank 5 1/4" Square, Papers: WeRMemory Keepers Designer Scrapbook Pack Grandma's Kitchen, Stamp: Gina K. Designs-owl always love you, Ink: Stampin Up-Soft Suede, Whispers-Whisper Vanilla, PrismaColor pencils, Gamsol, blending stump, Rhinestone stickers-gold, Coluzzle Circl cutting template, Stampin Up-piercing pad, Sakura Gelly Roll pen-Gold. AWWW This is soooo super sweet, love those darling owls!!! 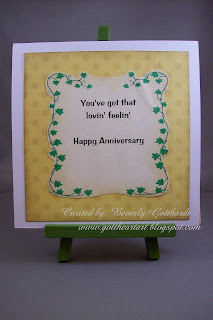 ADORABLE card...thanks so much for joining us this week at Saturday Spotlight! Those owls are so cute! Your stitching rocks! Thanks for joining us for this week's Tuesday Throwdown. This is so adorable. Love the owls and the monochromatic colors. Great take on the Sat. Spotlight. Beverly this card is a hoot! Love your faux stitching! Thank you for playing along with Just Us Girls stitching challenge! I hope you area able to join us Saturday! This is beautiful Beverly and those owls are so cute. Love the way your card is put together. Thanks so much for joining us at Polka Doodles this week. Thanks for posting the link to it, even if you missed the deadline for the challenge, loved seeing your card! 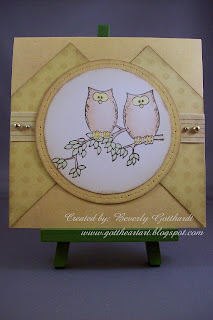 Super card and wonderful layout, thanks for joining Polka Doodles! Love the owls! Thanks for entering the Polkadoodle Challenge - hope you can join us again next week! What a lovely card! Thank you for playing along with the Tuesday Throwdown from Sherrod Studio! oooh...fun! I sure hope you join us again tomorrow for another Tuesday Throwdown!